This is the latest I have ever posted a favourites video, I do apologise! Again like I’ve already said in my January update post, I have to prioritise uni over this little area now and again…but anyway, without further ado lets get on with my favourites of January. 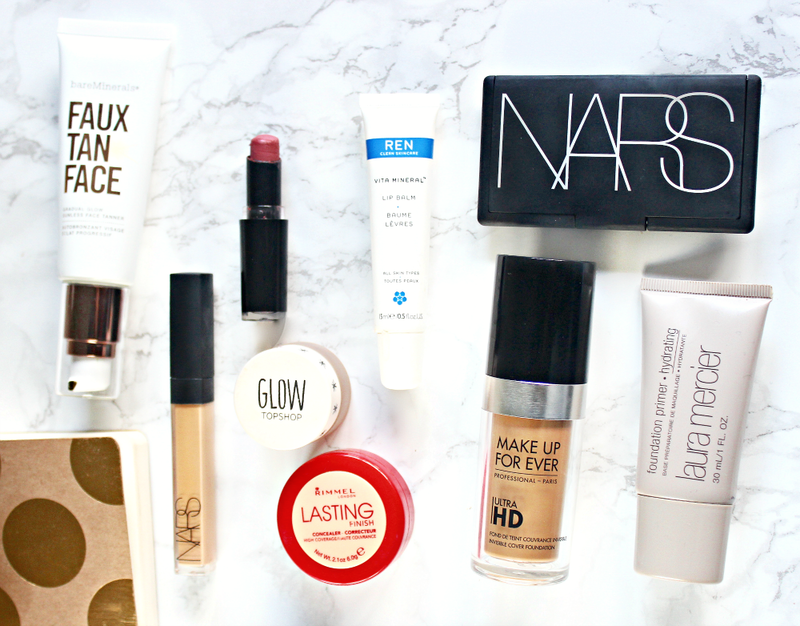 Starting with the bases I have been loving the Make Up For Ever Ultra HD Foundation in Y365 (£29) which I have been promising a review for over a month now, it is coming I promise! But to give you a quick summary, it looks like skin that I wish I had woken up with! Light to medium coverage and a formula which sits between satin and matte to me, it feels weightless on the skin and my favourite part about it is that the colour match is the most accurate I have ever found! January was the month that I finally got on board with the NARS Radiant Creamy Concealer in Ginger (£22.50) which I have owned for a good few months, but as this shade is a great match for my skin tone and not brightening for the under-eyes I just didn’t find myself reaching for it that often. I should have picked up custard, but as I have this shade and can make it work I made myself pick it up more often and the creamy formula and delightful coverage that many a YT-Guru have raved about is lovely! I found that wiggling the applicator around the tube got a tonne more product out and although its not brightening or highlighting under the eyes, it worked well to conceal on a more low-key look y’know? It is also great for covering redness and blemishes on the days I didn’t wear makeup (which I’ll talk about below!). 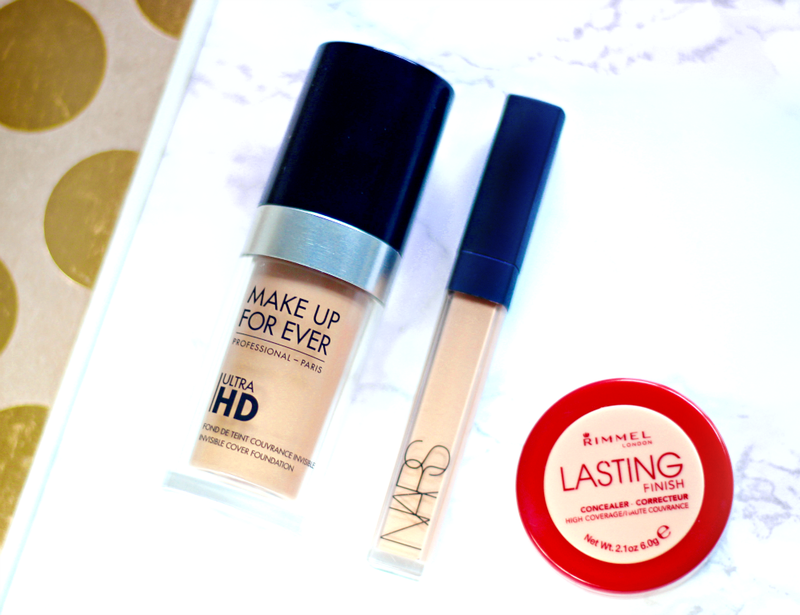 Finally from the bases I rediscovered and became slightly obsessed with the Rimmel Lasting Finish Concealer in 3 (£5.49). It is a lovely peachy shade which corrects 80% of the darkness under the eyes in less than 5 seconds! A little goes a long way, which really minimises creasing and I can easily layer a brightening concealer over the top. It is an essential in my makeup bag and I will be repurchasing several backups in May! The next favourite is perhaps a little controversial, especially being an Asian girl but I have absolutely loved it for more reasons than one so I had to share it; the Bareminerals Faux Tan Face Gradual Glow (£18.00). Before this I had only tried fake tan given to me at a blogger event and I had no desire or need to use it on my arms and legs. However for quite some time I’ve been wanting to wear foundation less often, but my face happens to be a good deal lighter than my hands because I always protect it from the sun, so without foundation I look so peaky and pale. 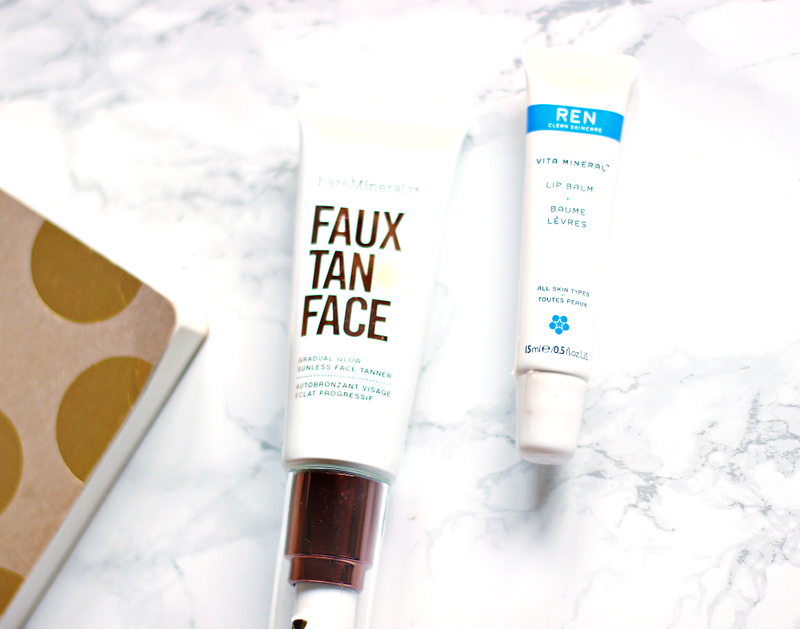 I wanted to try a tanner which was gentle enough to use on my face and also not clog the pores. When I saw this on look fantastic in the December sales I couldn’t resist. So far I’ve used it about three things and the first two times were great, my skin was a beautiful olive shade (not orange in the slightest) and it matched my hands and neck really well. All I wore on my face was concealer and I LOVED it! This time I may have applied a little bit too much as it’s a tad uneven (I still need to figure out the best application for it, other than my fingers) and I would be lying if I said it didn’t smell at least a little like fake tan. However the fact that the colour looks naturally sun kissed and spares my skin from a full on base for at least three days I can get over the scent! I have also been loving the REN Vita Mineral Lip Balm (£9.00) which has been the fastest acting balm I have tried in a while. I totally agree with the description, it is deeply replenishing and any soreness and chapped lips were soothed literally overnight! I hate those balms that you have to constantly reapply and this is not one of them. It is also miles better than the NUXE one at actually doing what it’s supposed to do! I don't think I can be without this stuff and the fact that it is paragon, sulphate, mineral oils, fragrances etc free is yet another tick in the box for me. If you’re looking for a lip balm that actually works, spend a little extra and I’m sure you’ll never look back! The Laura Mercier Hydrating Primer (£29) has blown me away this month. When I initially got it in a Space NK goodybad, I felt pretty ehh about it, didn’t use it much and ended up putting it away. However since being on my ban I have had a good root through my stash and rediscovered this with a very different experience. It is actually hydrating, without being sticky or heavy on the skin, makeup goes on so much smoother…and the best part? It really does keep my base on for longer, which means previous foundations I complained about, for fading away quicker than I’d like (Bourjois happy light!!) will work so much better for me now. The Topshop Glow Pot in Gleam (£9.00) reviewed here has been another item I have rediscovered and it’s such a gorgeous cream highlighter against my olive skin tone! 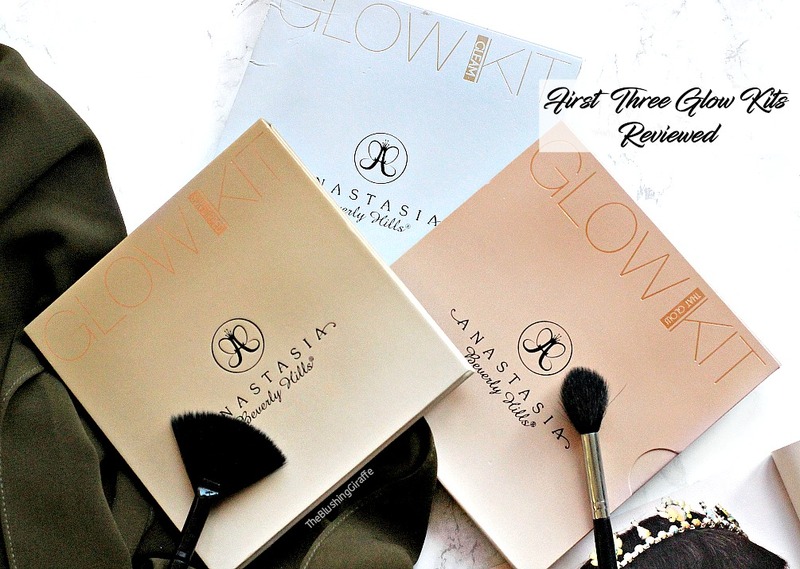 I love how quite and easy it is to use with the tips of my ring finger, alone or as a powder highlight base, it has been a firm staple in my makeup routine this month! I was going to post my LOTW on sunday, but I already has the update going up then, so I’ve decided to wear the Wet’n’Wild Mega Last Lipstick in ‘In the Flesh’ ($2.75) for the second week in a row because I have loved it that much. It is a medium pink, mixed with a tiny bit of dusty pink if that description makes any sense?! You’ll be getting full swatches this sunday, but this line of lipsticks are honestly one of my all time favourites. Creamy, pigmented, they last a good 3 hours and then they fade evenly. Highly recommend! Finally, last but certainly not least my final favourite of the month is the NARS And God Created The Woman Eyeshadow Palette (£40.50)! I purchased this in the summer of 2014, hid it away as motivation for my exams that year and quite honestly I totally forgot about it *inserts red faced emoji here*. I found it a few months ago and throughout January it was the only palette I used because the quality of the shadows are glorious. They’re all one-swipe wonders, which to be honest with you at that price point I would expect! The shadows last on my lids all day and the size of the palette is so perfect for travelling (although shockingly small if you’ve never seen it in real life before!). I don’t know how many of you have seen the beautiful customisable NARS palette (link here), you can create your own and I had a lot of fun playing with this feature and then wincing at the price! ONE DAY I would love to create my own, but not while I currently have so many products not in pan form, it would feel like a waste. A lot of the shades that I had put in my custom palette online, I already owned in this little palette, so I’d recommend checking it out if you want some NARS shadows, a brush AND the pro prime (both of which I am yet to try out!). 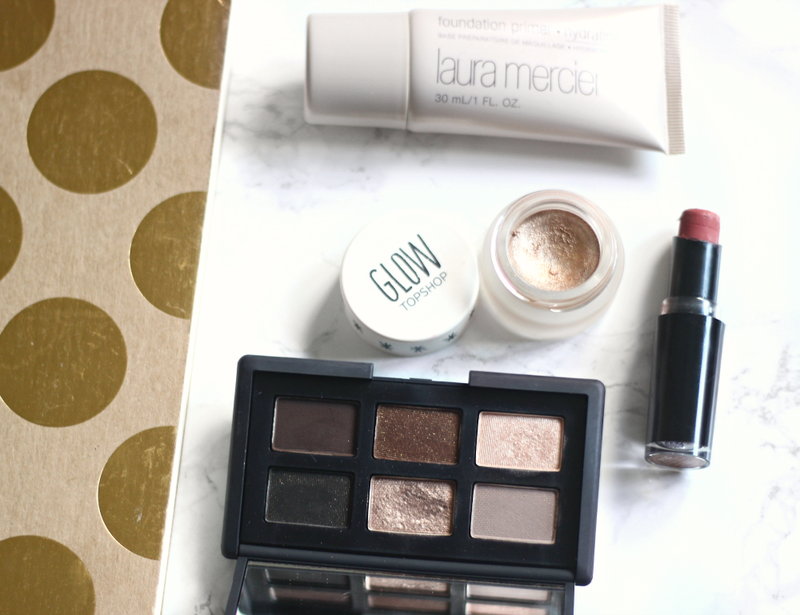 Have you tried any of my January Favourites? What have you been loving this month?